Asgardian Stones is all about ancient mythology. Its gameplay board is standard but that’s about all that is about the title. Netent have loaded it with special features, an amazing art style, and a character all its own. Put simply, it’s a fantastic game. Fantastic atmosphere. The art style really gives this title a unique and magical feel. So many varied bonus features. We’ve rarely seen a game that uses so many different gameplay dynamics. This is a credit to Netent. Orange Mask = 500x the line bet. Green Mask = 300x the line bet. Blue Mask = 150x the line bet. Purple Mask = 120x the line bet. Grey Mask = 100x the line bet. Symbols on Asgardian Stones fall into their position on the reels rather than spinning. Each time a winning combination is made, an Avalanche will begin. The symbols comprising the winning combination explode and disappear. This leaves space for a second Avalanche of symbols. These Avalanches will continue until there are no more wins possible. The wins accrued during the Avalanche feature are added to any bet line winnings. 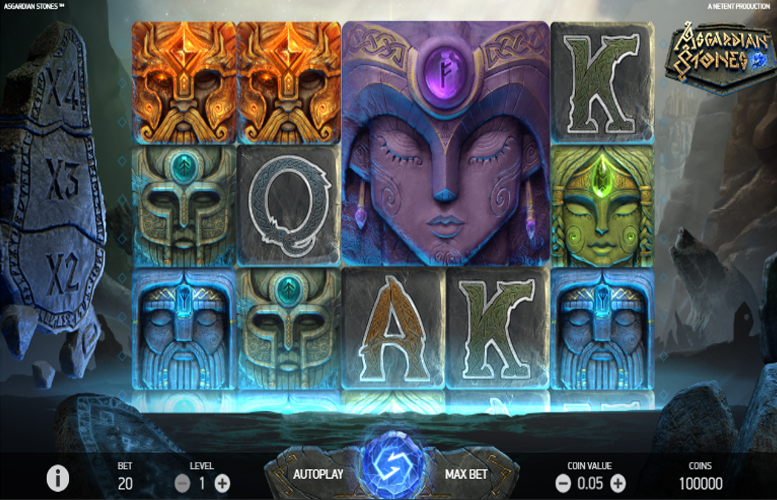 Almost all symbols during the main game and free spins round can also appear as a Colossal version. The only one that is unable to is the game’s “wild” symbol (during the main game). Each Colossal symbol is a block of icons that is either 2×2 or 3×3 symbols. Colossal symbols are fully or partially displayed depending on how the reel lands. Symbols in winning combinations explode and disappear. This means that the entire Colossal symbol is removed even if only a small section of the symbol took part in the winning combination. All remaining symbols will fall to the bottom-most position to fill the empty spaces. This leaves space for a new Avalanche of symbols. Again, the Avalanches will continue until there are no more wins possible. During the Avalanche, a Colossal symbol may fall onto the reels too. Once this has been placed, any remaining spaces are filled with regular symbols. Players should note: It is not possible to have two or more Colossal symbols visible at the same time. After the first Avalanche, the Colossal Crush feature can be activated in both the main game and during free spins. A Colossal symbol must always have symbols in all the positions directly underneath it. If there are still empty positions beneath the Colossal symbol, because of a previous win, the Colossal symbol falls, crushing all symbols on the row under it. This continues until the Colossal symbol is at the bottom of the screen or until there are no empty positions underneath it. Every time a Colossal symbol falls down a row and crushes at least one symbol, a multiplier is awarded. For each row of symbols crushed, the multiplier increases by one. This continues to a maximum of 4x. The multiplier is applied to the next win evaluation and is then reset to 1x. The Bonus Wheel is a symbol block of 3×3 symbols that can land on the last three reels only. It can occur in both the main game and during free spins. It may land full or partially in the gameplay area. Once all Avalanches and win evaluations have been made, the Bonus Wheel stops. It will then award coin wins, free spins, or both. The number of coin wins and free spins won in the active fields of the Bonus Wheel will be equal to the number of rows that the 3×3 symbols covers. This means players are awarded an extra prize for each row. Unlike regular bonus, the Bonus Wheel is not removed after the win is awarded. This means there will be no avalanche after its evaluation. In addition to the Colossal Crush feature multiplier, the coin win values on the Bonus Wheel are also multiplied. However, this multiplier is not reset if there is a following Avalanche. Instead, if the multiplier increases again, the multiplier on the coin wins is increased further. When the Avalanche stops, the Bonus Wheel coin win is evaluated. A coin win from the Bonus Wheel is one, two, or five times the total bet. This means that the maximum coin win is 36x the total bet. There are three fields on the Bonus Wheel that award five free spins each. A win from the Bonus Wheel in the main game may therefore activate five, 10, or 15 free spins. In Free Spins, the “wild” symbol may be a Colossal “wild” symbol. If a Colossal “wild” forms part of a winning combination, it is split up into 1×1 “wild” symbols. The “wild” symbols that are part of a win will explode and disappear. The others will stay on the reels and are part of the next Avalanches until there are no more wins. The Bonus wheel can be reactivated a maximum of three times in Free Spins. This means it can trigger a total of 25 additional free spins. Ace, King, Queen = 30x the line bet. Players can adjust the number of coins they bet on each of the 20 win lines on Asgardian Stones and the value of each. The minimum and maximum values are 1p and £1 respectively. Meanwhile, they can use between one and ten coins on each line. This makes the minimum bet possible per spin just 20p and the maximum £200. 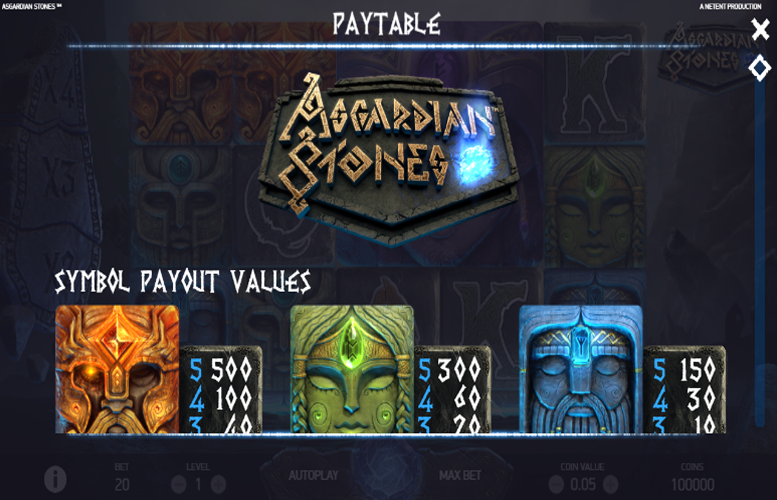 With an absolute plethora of special features, an amazing art style that creates a unique atmosphere, and little if anything to critique, Asgardian Stones is without doubt the best slot machine we’ve reviewed to date. We think its flawless, hence its perfect score. This game has a rating of 5 / 5 with 781 total reviews by the users.